I've been posting a lot here about iPhone/IPod Touch/IPad apps, but I haven't mentioned the one app that actually has "decimal time" in it's name, Decimal Time Converter by CodeBurners (free). That is because it is a different type of decimal time. You have probably heard by now about the new Apple tablet that Steve Jobs announced here on Wednesday, the iPad. Since it will run iPhone apps, that means that all the decimal time apps will work on the iPad the day it's released. I have made a list on the right side of the page of all the apps I have posted about on this blog. I don't know about apps on other devices, such as Android phones. Does anyone else? Decimal time apps keep appearing. Metriclock by Stotion was released on January 23 (55219) for $0.99. It is not only a clock, but also a "metric stopwatch and metric timer". The units have new names. 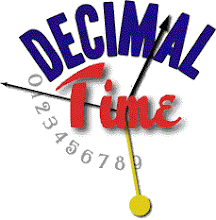 Decimal hours/decidays are called "alkas", decimal minutes/millidays are called "zimits" and decimal seconds are called "ozzis", I don't know why. I have not tried it, but I see from the app store that it features a digital display with multicolored digits and a plain dark background. The associated website is http://floint.com, which is in Flash, and therefore cannot be viewed on an iPhone. Doh! It's also difficult to view on my laptop, since it's a huge image which is larger than my screen, but I can see that it shows some pics of the app running on an iPhone. Apparently Swatch no longer sells .beat watches. These were the only mass-produced watches with decimal time. Fortunately, they are still available on eBay, where I bought one a few years ago. I stopped wearing it when the band broke; I'm not much for wristwatches anyway, and I use my mobile for the time, like most people now. Now the battery is dying, so the display is blinking and the light does not come on, but it still works, for the moment. For some time I have looked for examples of how decimal time was used in France, so that I can represent it accurately in my scripts. Most of them are written out in full, as in "five hours and fifty minutes decimal". In both French and English of the period, it was customary to write a small "h", "m" and "s" after the hours, minutes and seconds, respectively, and even today it is common in French to put an "h" between the hour and minute, instead of a colon. It therefore seemed likely to me that they would have written decimal times in a similar way, although they would have to distinguishable from standard times. It's a bit awkward to use double letters for each unit, but it seems likely to be correct, so I going to use this notation from now on. Decadi 30 Nivôse an CCXVIII à 5hd 77md t.m.P. I already mentioned earlier one free Swatch beats/Internet Time app for iPhone/iPod Touch, Internet Beat by Thomas Cherry. Dennis pointed out in his comment that this app has a bug, because it updates once per second, and a centibeat is less than one second, so it sometimes skips a centibeat. This is a pretty minor bug. However, I have noticed a bigger one. Half the time, when you turn the phone from portrait to landscape, the number of .beats changes. This is because when the centibeats are displayed in landscape mode you are seeing the exact number of .beats, but when in portrait mode it is rounded to the nearest .beat, instead of simply truncating. For example, @199.50 becomes @200. This is like saying that 1:59:30 is 2:00. A clock should not do that. If you go to the official Swatch website you will see that the app is half a .beat fast when in portrait mode, or 43 seconds. I also found another app, InternetTime by Jaewon Choi for $0.99. I have not tried it, but I can see from the picture that it displays a map of the earth in the background, with approximate areas of day and night. It also shows the current date, and unlike the other app displays leading zeros, such as @090 instead of @90. I have posted the current republican date at the top of this blog, according to the original equinoctial rule, although for the current year this is the same as both Brumaire and Romme. minutes ahead of GMT. I posted earlier about decimal time iPhone apps. I had also searched for an app for the French republican/revolutionary calendar, as the calendar was tied together with decimal time. I even searched the French word "calendrier", but did not find one. This calendar was used from 1793 to 1805, and replaced the 7-day week with the 10-day décade, with exactly three décades (i.e. 30 days) a month and five or six extra days at the end of the year, which began on the autumnal equinox in September. The odometer has rolled over from 20091231 to 20100101. An new day, new month, new year, new decade, at least for the Gregorian calendar. Of course, it's only 20091219 on the Julian calendar, and something else on every other calendar. You can see a few of them at Calendrica. That's why integer dates were introduced, to sort through this confusion of calendars. For instance, Julian dates start from the year 4713 BCE and count days continuously. No years, months, weeks, just days. Modified Julian dates use a more recent epoch, in 1858, while truncated Julian dates count from 1968. Excel serial dates count days from 1900 CE. Unix time is finer, counting seconds from 1970.